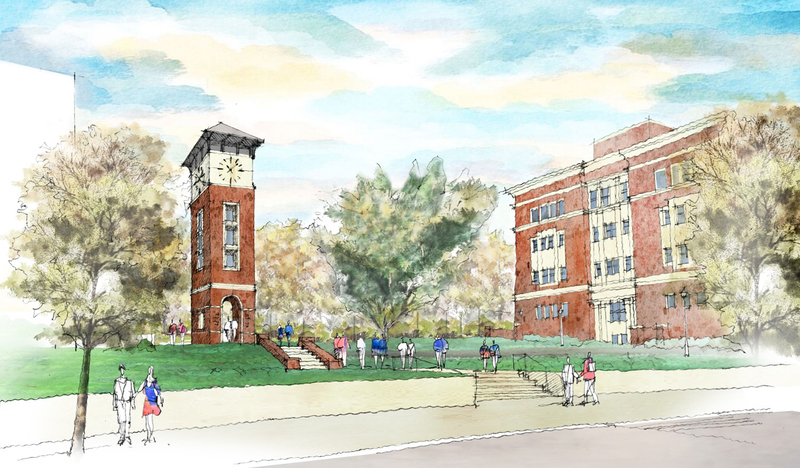 Allen Tate Company is pleased to announce plans to build a clock tower on the campus of Central Piedmont Community College (CPCC) in Charlotte. Members of the Allen Tate family and representatives of the Allen Tate Company broke ground today for the Allen Tate Tower on the college’s Central Campus. The tower is a gift to the college from H. Allen Tate, Jr., company founder and CEO. The tower, to be completed in early 2015, will serve as a landmark and focal point of the campus. The brick and cast-stone structure will stand approximately 48 feet tall, with a base of 144 square feet and will feature a four-sided clock face approximately six feet in diameter. Little Diversified Architectural Consulting is providing the design work on the project. “CPCC is an outstanding institution that prepares students for employment and lifelong education. This tower will serve as a great symbol of achievement and reminder of the hard work and commitment the students have made to achieve their goals,” said Tate. The clock tower will be located on Elizabeth Avenue, between the Terrell Building and the Elizabeth Classroom Building. The prominent site will give students, employees and passing motorists a clear view of the tower.